 Log In needed $13,488 · 2013 Chevrolet Trax LT 1.4L AWD, Backup Cam, Bluetooth, Rmt Start! 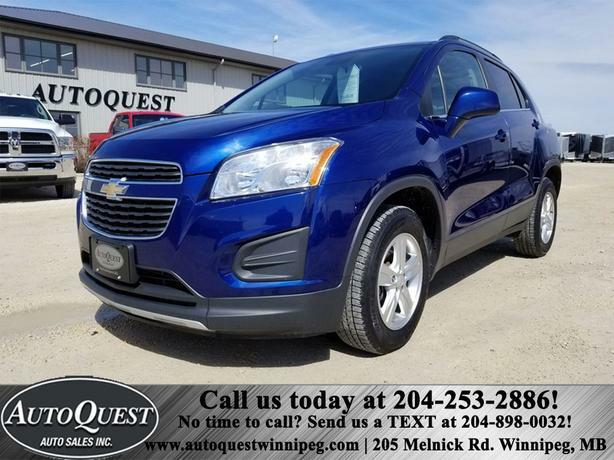 Well-equipped 2013 Chevrolet Trax LT 1.4L AWD featuring Chevy MyLink, Backup Camera, Factory Remote Start & Keyless Entry, Bluetooth, Power Seat, Power Locks, Windows & Mirrors, A/C, Cruise Control, AM/FM/Satellite Radio, OnStar, Tilt Steering and Traction Control! Accident-free, Safetied and Serviced with 112,370 kms! $13,488 plus PST/GST. Dealer #0135. Detailed and reliable CarFax report available. WE OFFER A WIDE VARIETY OF EXTENDED WARRANTY PACKAGES TO SUIT YOUR NEEDS AND BUDGET!